THIS GUARANTY AND SURETYSHIP AGREEMENT (this “Guaranty”), dated as of ____________________, made by SALE LEASEBACK SELLER PARENT, a __________ corporation (“ Guarantor ”), to SALE LEASEBACK BUYER, a __________ limited liability company (“ Landlord ”). 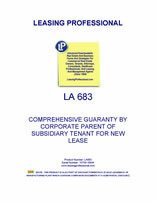 (b) all covenants, agreements, terms, obligations and conditions, undertakings, and duties contained in the Lease to be observed, performed by, or imposed upon Tenant under the Lease, whether now existing or hereafter arising, contracted, or incurred (collectively, the “ Performance Obligations ”), as and when such payment, performance, or observance shall become due (whether by acceleration or otherwise) in accordance with the terms of the the Lease, which terms are incorporated herein by reference. The Guaranteed Obligations shall not be affected by either Tenant's voluntary or involuntary bankruptcy, assignment for the benefit of creditors, reorganization, or similar proceeding affecting Tenant. If for any reason any Monetary Obligation shall not be paid promptly when due, Guarantor shall, immediately upon demand, pay the same to Landlord when due under the terms of the Lease. If for any reason either Tenant shall fail to perform or observe any Performance Obligation, Guarantor shall, immediately upon demand, perform and observe the same or cause the same to be performed or observed. If, by reason of any bankruptcy, insolvency or similar laws affecting the rights of creditors, Landlord shall be prohibited from exercising any of Landlord's rights and remedies, including, but not limited to, enforcement of the terms of the Lease against Tenant, then as to Guarantor such prohibition shall be of no force and effect, and Landlord shall have the right to make demand upon, and receive payment and/or performance from, Guarantor of all Guaranteed obligations and Guarantor's obligation in this respect shall be primary and not secondary. Guarantor acknowledges and agrees that the Monetary Obligations include, without limitation, Rent and other sums accruing and/or becoming due under the Lease following the commencement by or against Tenant of any action under the United States Bankruptcy Code or other similar statute. Guarantor shall pay all Monetary Obligations to Landlord at the address and in the manner set forth in each Lease or at such other address as Landlord shall notify Guarantor of in writing. (p) any other event, action, omission or circumstances which might in any manner or to any extent impose any risk to Guarantor or which might otherwise constitute a legal or equitable release or discharge of a guarantor or surety. all of which may be given or done without notice to, or consent of, Guarantor. No setoff, claim, reduction or diminution of any obligation, or any defense of any kind or nature which either Tenant or Guarantor now has or hereafter may have against Landlord shall be available hereunder to Guarantor against Landlord.